Hydroponics systems require a carefully crafted fertilizer, or nutrient solution, to grow optimally. Choosing the right nutrient solution is key to system health and production. If you are starting a hydroponic system, or switching nutrient solutions, you’ll want to take several factors into consideration. Whether you’re growing for fun or growing for profit, you’ll first want to consider both convenience and price of fertilizers. As you’ll read below, hydroponic fertilizers come in two different forms: liquid and powered. If you’re a hobby grower just starting out, you probably want to go with something less hassle (i.e. a harder to make mistakes with) like a liquid solution. While this type of solution is a bit more expensive, don’t forget the value of your time (and your sanity!). For commercial hydroponic growers, powdered forms offer better value in bulk quantities but take a bit more skill to perfect. As mentioned above, hydroponic nutrients are sold either as a premixed liquid solution or a powdered form. Liquid nutrients are more commonly used for hobby systems as they make adding fertilizer quick and easy. For example, we recommend a liquid nutrient solution for the Farm Wall, as most Farm Wall growers don’t have the time or resources to mix up a powder fertilizer. We’ve seen the most success with Dyna Gro Foliage Pro, a premixed liquid fertilizer with a 3-1-2 NPK ratio. For this reason, it’s the solution we trust to get our beginner hydroponic growers off to a good start. Powdered or dry fertilizers typically are sold as a two-part powder mix. The first part is calcium nitrate and the second is the main nutrient mix. Most of these two-part mixes are complete solutions, but a few will require another compound (such as magnesium sulfate—a.k.a. Epsom salt) to be added as well. Although powdered fertilizers are more complicated to use than liquid solutions, there is a big benefit in price. Since nutrient solutions are mostly water (only a few teaspoons of powder are used per gallon of water), shipping large quantities of solution is extremely expensive—you end up shipping a lot of water weight. Larger hydroponics systems usually use powdered mixes because you don’t have to pay for the weight of the water in shipping costs. Another plus is that you can get powdered mixes specific to different crops—a strawberry mix, a lettuce mix, etc. (although this can also be true of liquid solutions). Read more about mixing hydroponic nutrients here. Hydro Gardens sells a variety of formulations of fertilizer. Don’t forget nutrient costs as they can creep up on you over time if you’re not careful. If you are growing in a Farm Wall, adding nutrient solutions is easy—add the amount of Dyna-Gro specified on the instructions when you start the system and add new water with Dyna-Gro each time you replant. We designed the Farm Wall for ease of use, minimal work and maximum returns. Knowing when to add a solution to larger hydroponic systems is a little trickier. 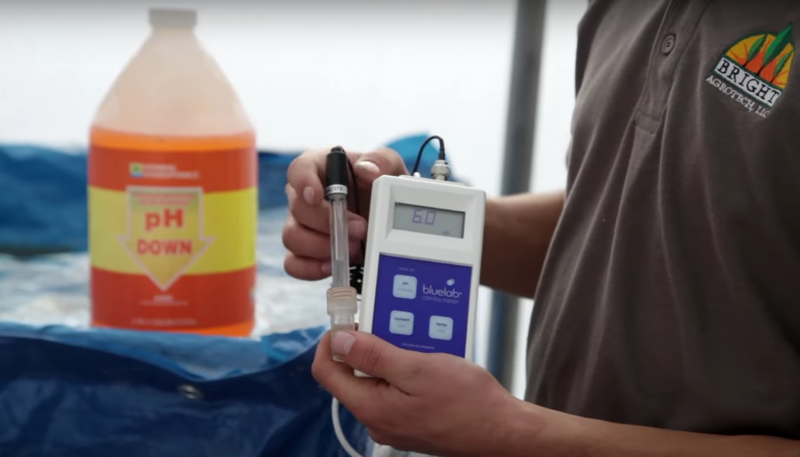 You’ll want to be taking two measurements on a fairly regular basis: pH and EC. A measure of EC (electrical conductivity) will tell you when your system is running low on nutrients. EC is essentially a measure of the salts—and therefore the nutrients—present in the solution. EC should be between 1200–1500 parts per million, but this number depends both on the crop and water demand. The best way to decide where to set your EC threshold is research! Another thing that is crucial when adding solution is pH regulation. pH dictates the “usability” of the nutrients by plants and microbes. How often should you check your system? If you are hand dosing your system (testing the water yourself), you will want to check it once or twice a day. The more convenient option is to buy an automated dosing system—a computer with sensors and pumps hooked up to a solution which tests the water in your sump tank for you (every 5 or 10 seconds) and corrects it automatically. One such dosing system is Autogrow’s IntelliDose. Hydroponic pH and EC levels can be measured with a dual meter. So what are the best hydroponic nutrients for your system? Hopefully, this post has helped you in choosing the right nutrients for you. Remember, before you go out and buy any old solution, there are a few things to keep in mind. You’ll first need to decide whether you’re leaning towards convenience or price. Are you willing to spend more on less hassle and potentially fewer mishaps? Or are you looking to save costs and experiment with mixing your own? There are several incredible resources out there on hydroponic nutrients, and we outline more tips and tricks for optimal growth in other resources. As always, we provide free resources for growers like you so that you can have a successful system. Planning a system? Take courses to learn what you need. Learn everything there is to know about starting a farm business through Upstart University. The self-paced online course set prepares growers to produce, harvest, and sell their food in a way that fits their needs and goals. Sign up today! Revisiting this post coz I wanna find out what other brands are also okay～ From this article，I get the general idea the usage of nutrients， the convenience and budget tradeoffs. But I do wonder about how do I choose what brand to choose from. I am exploring alternatives as I’m in Hong Kong and there is only 1 hydroponic shop that I found, and they only sell liquid hydroponic solution. I do wanna have some comparison. I forgot to add that, there are lots of nutrients here, but all are for non-edible flowers. What is the difference? I built a flo & ebb unit. I am using rain water and planting peppers. What type of nutrients should I use? 35 gal. holding tank. Hydro-Gardens sells a ChemGro pepper and herb formula that will work well. Make sure to get the calcium nitrate and magnesium sulfate to go with it.